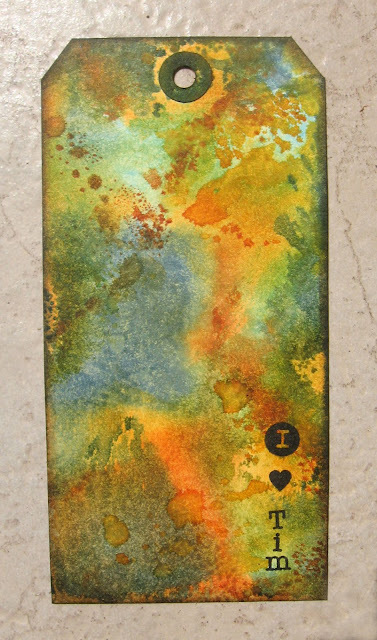 I'm so excited to be participating in Tim Holtz's first online course "Creative Chemistry 101." Today (Day 2) was our first official day of techniques after Day 1's education on different types of inks, surfaces, and reactive properties of each. If you don't know about Tim's course, it is offered at OnlineCardClasses.com and for the next two weeks, we'll be learning a slew of stuff about the chemistry behind the creativity through hands-on learning. I am already impressed at how organized and thorough the course is. I'm a big fan of keeping things simple and organized and Tim has nailed it with his charming videos, PDF printable files, pre-made labels, great photos, and clear and concise demonstrations. The technique videos are just the right speed so that I can get up and work on my tags as Tim teaches. Not too fast or slow. If I need to, I can just pause until I catch up. I can't think of a better way to spend a few hours of my day! 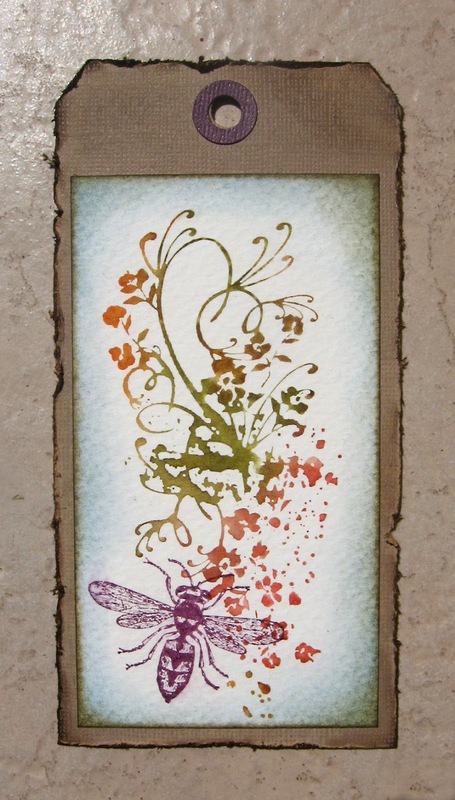 For some, this course is a great starting point using Tim Holtz products. For others, it's more of an overview. For me, it's a bit of both. I think everyone will be happy. Students in the class have to option to upload their technique tags each day, so I thought I'd start off doing just that by first posting here on my blog. 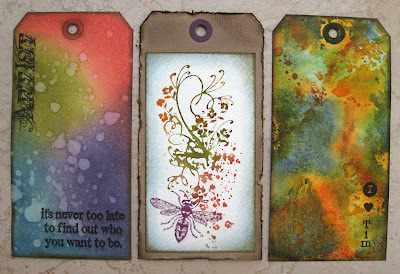 My goal is to keep my tags simple, allowing the technique to shine and stand out as good reference for me and my customers to see. 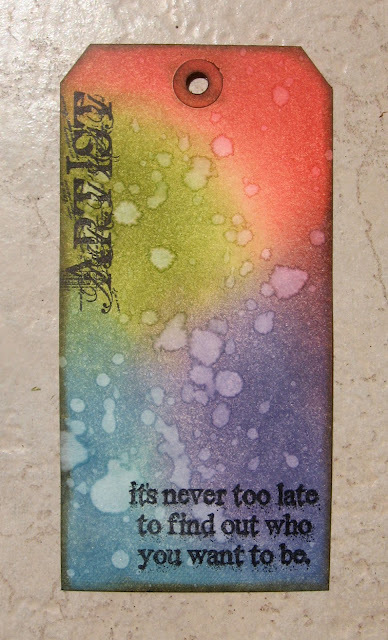 Of course, I can't resist adding just a bit of stamping or embellishment to make them my own. 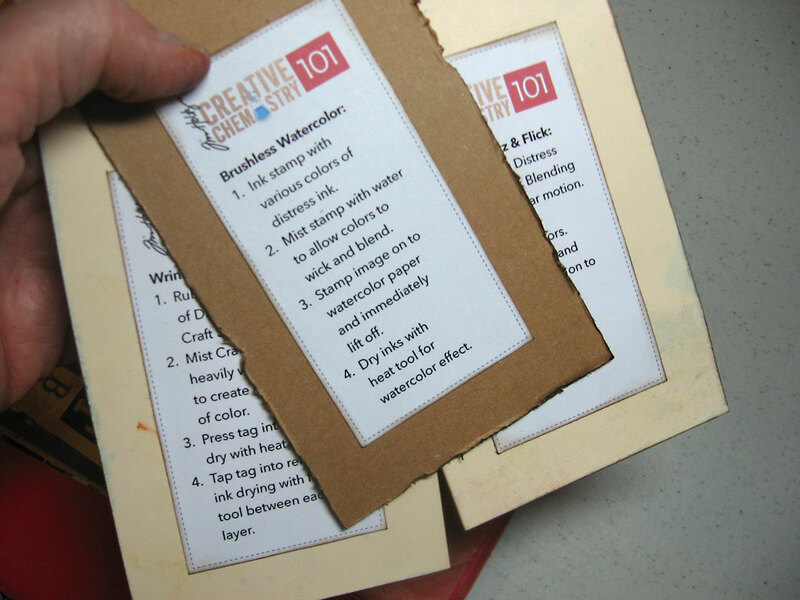 Like I said, Tim provides class members with these great PDF printable labels with the techniques spelled out for us to attach to the back of each tag. I love this! Thank you Tim! "Blended Distress/Spritz & Flick Technique"
I'm not a flirt. Really. I just truly love Tim for sharing with us, keeping it interesting, making it fun, and inspiring and encouraging us. He's super cool, that guy. Who can't love him? I'm pretty sure that although the course has already started, you can still sign up. It's not live. Once you register, you get access to the files and videos as long as you like. So be sure to check it out, and stay tuned here each day as I share my learning experiences with you. I love the tags you made!! I am so excited to be taking the class as well and agree with everything you said about the class! Wow those tags are awesome !